Whether you call it high tea, low tea or afternoon tea, afternoon tea is an occasion to socialize and relax in style with friends. Selecting a great tea for afternoon tea is just one of the many aspects of the occasion, but it's often largely overlooked by people putting on or attending afternoon teas. This list of top ten afternoon teas includes old and new favorites that are well suited to pairing with ​afternoon tea fare. Earl Grey is the world's most famous flavored black tea. It gets its citrusy flavor from the essential oil of bergamot (an orange-like fruit). The natural sweetness of Earl Grey lends itself to pairing with many afternoon tea sweets, like scones, Madeline cakes, and shortbread cookies. Assam black tea is grown in the mountainous region of Assam, India. It is known for its robust, malty, and sometimes tannic (astringent) flavor. Many people enjoy their Assam tea with a little milk and sugar. With milk and sugar, Assam teas are ideal for afternoon tea sweets. Without them, Assams can stand up to flavorful savory foods, like finger sandwiches and quiche. Darjeelings are teas from Darjeeling, India. 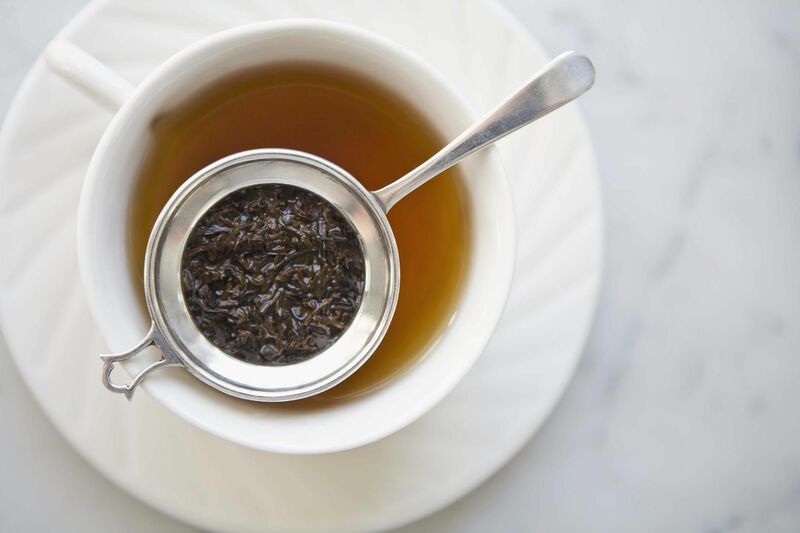 Darjeeling black teas are a classic pairing for afternoon tea foods. You might have a choice between spring-plucked Darjeeling First Flush and summer-plucked Darjeeling Second Flush. Darjeeling First Flush is more floral and green in flavor, while Darjeeling Second Flush has a distinctive fruity flavor. Both work well with savory afternoon tea foods, and Second Flush is also great with chocolate, fruity desserts, and pastries. Chamomile is an herbal infusion with a floral, apple-like flavor. Many people select it for afternoon tea because it is naturally caffeine-free. It also pairs wonderfully with afternoon tea sweets, especially scones and fruity confections. Chamomile is also a key ingredient in many tea blends, such as David Rio's Caramel Chamomile. Like chamomile, spearmint and peppermint are caffeine-free herbal infusions. Peppermint is more common in the U.S., but spearmint also has a loyal following thanks to its sweeter, mellower flavor. Some herbal infusions combine mint with other herbs. When considering whether or not to pair a mint infusion with your afternoon tea fare, ask yourself, "Would I ever use mint as an ingredient in this dish?" You'll likely find that both types of mint "tea" are great with a range of finger sandwiches, fruity sweets, chocolatey sweets and neutral sweets (like vanilla pound cake or plain shortbread). Rose Congou is a black tea blended with rose petals. The rose petals make it an inherently romantic, Victorian style of drink, so it's a great fit for afternoon tea. Try sweet, perfumey Rose Congou with scones, creamy sweets (like shortbread or strawberry shortcake) and savory-sweet finger sandwiches. Lapsang Souchong and Russian Caravan are both popular smoked black teas. They have a strong, smoky flavor that's ideally paired with equally strong foods. I particularly recommend them with heavy sweets, smoked salmon finger sandwiches, and flavorful quiches. Specialty smoked black teas include Tarry Souchong, Smoked Earl Grey and Smoked Tanzanian Black Tea. These can be paired in a similar manner to Lapsang Souchong and Russian Caravan. Green teas aren't nearly as popular as black teas during afternoon tea. However, Gunpowder Green Tea has a bold flavor that can stand up to select afternoon tea foods, like savory pastries, ham or chicken tea sandwiches and dishes with mint. Be sure to brew Gunpowder Green with cooler water and a shorter brew time than you'd use for black teas. Brewed on its own or as part of a tea blend, lavender is a common "tea" for afternoon tea. Popular lavender blends include Lavender Earl Grey and herbal melanges with ingredients like lavender, chamomile, and mint. The sweet, perfumey flavor of a lavender infusion or lavender tea blend is ideal with uncomplicated afternoon tea foods, like scones and Devon cream, simple petits fours or shortbread cookies. If you prefer your afternoon "teas" to be caffeine-free, explore this list of herbal infusions.